Habit: Annual [perennial herb], glabrous to hairy. Stem: decumbent to erect; base generally branched. Leaf: petioled to sessile; blade generally ovate to round or reniform, entire to toothed. Inflorescence: terminal and axillary, each head-like, subtended by leaves. Flower: calyx 5-lobed, lobes +- equal, generally acuminate; corolla 2-lipped, upper lip hood-like, lower lip +- 3-lobed, lateral lobes < central; stamens 4, fertile, generally enclosed by upper lip, anthers generally hairy; style +- equally 2-lobed. Fruit: nutlets triangular in ×-section, truncate distally. Stem: 1--4 dm. Leaf: blade 1--2.5 cm, wide-ovate to +- round, base truncate to lobed, margin crenate to +- lobed. Flower: calyx 4--7 mm; corolla generally 10--18 mm, red-purple. Chromosomes: 2n=18. Ecology: Disturbed sites, cultivated or abandoned fields; Elevation: < 800 m. Bioregional Distribution: CA-FP; Distribution Outside California: widespread North America; native to Eurasia. Flowering Time: Apr--Sep Note: Cleistogamous flower corollas < 8 mm, generally not opening. 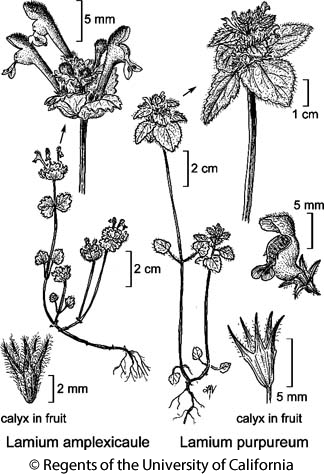 Citation for this treatment: John M. Miller & Dieter H. Wilken 2012, Lamium amplexicaule, in Jepson Flora Project (eds.) Jepson eFlora, http://ucjeps.berkeley.edu/eflora/eflora_display.php?tid=30151, accessed on April 24, 2019.